I’d seen a few rosettes of Hairy Bittercress (Cardamine hirsuta) in areas of the field at home that were protected from radiant cooling at night. 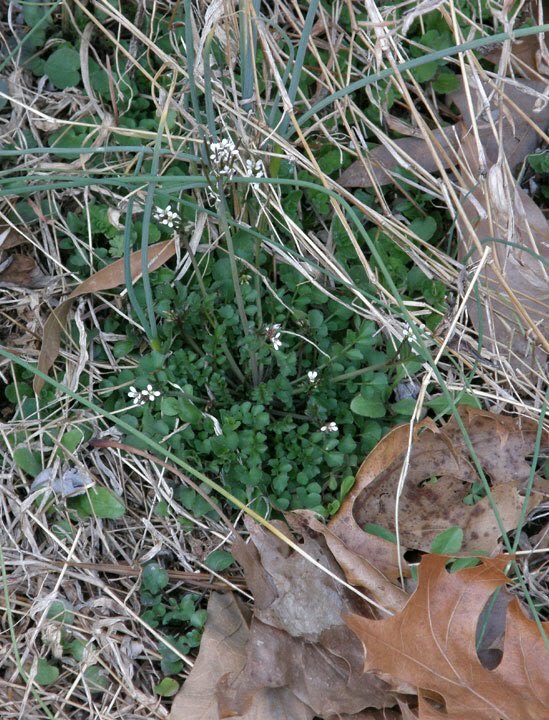 After finding the Hairy Bittercress with buds at Little Mulberry Park in Gwinnett County, I searched at home and found one plant with buds. During the following week, I found five or so more. Then, last Saturday, I found a single plant at the front end of the field that not only was sheltered from radiant cooling at night but also received a lot of sun during the day. This precocious plant had five flower stalks. 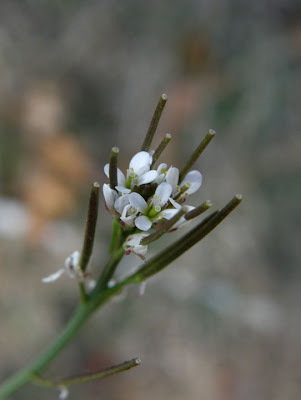 A closer view of the florets on one stalk. Seed pods are already developing from the centers of some florets. 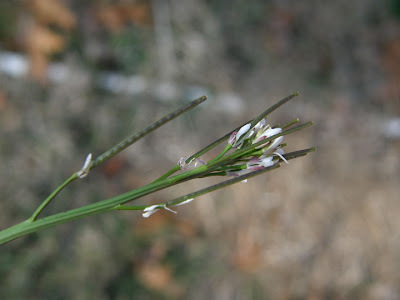 A closer view of the florets on the most developed stalk. 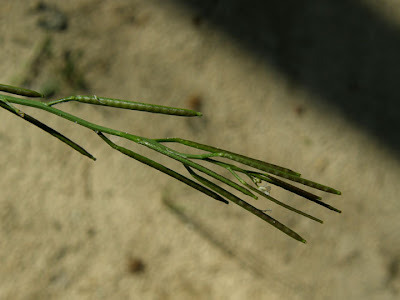 A view of a stalk in with developing seed pods. One seed pod already shows swelling due to the developing seeds. 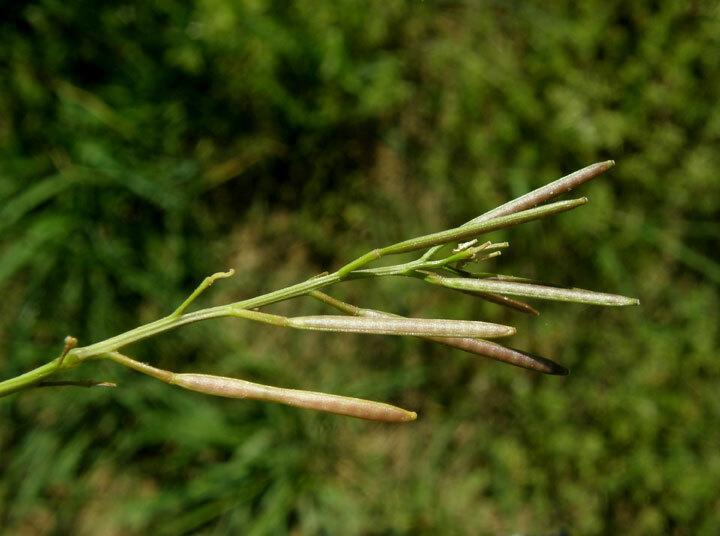 The seed pods will develop rapidly and spray the seeds when the pod splits open suddenly at the slightest touch. The following photographs were taken in 2010. A stalk with developing seed pods. It's almost impossible to touch ripe seed pods without the pods ‘exploding.’ The pod springs open. One half of the pod remains attached to the stalk and the other half detaches at the top and curls up rapidly spraying the seeds through the air. The seeds are sticky and adhere where they fall. This photograph shows the seeds and the halves of seed pods that have curled up when the pods sprang open. 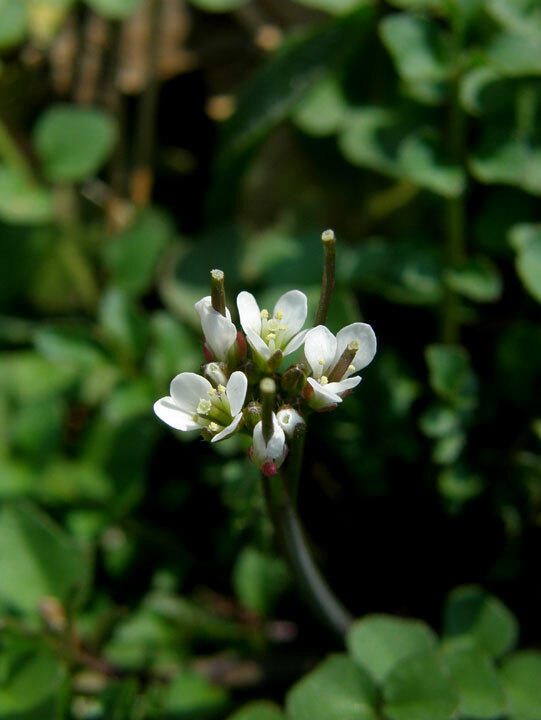 What a sweet flower - but it's those spring-loaded seed-spray mechanisms that always fascinate me. Great photos, too. I had a thought along the same line. The seedpods seems to develop very rapidly. 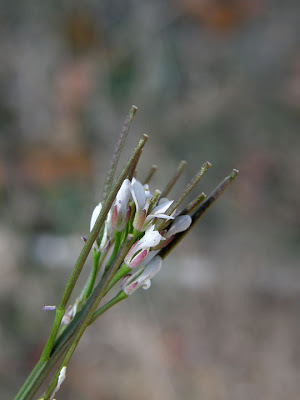 I wondered if, since they bloom early, they might be buried under repeated snowfalls and need to develop/release seed very quickly in order to survive year after year. So I'm not sure that they initiate blooming under snow or just get caught under snowfalls. We get very little snow here, so I can't test that hypothesis. I have only noticed blooms in spring. I'll have to keep an eye out for them It may be too hot here. Will keep an eye out in the fall although I don't recall seeing them. Yes, Mary, it is a sweet little flower. It's my consolation prize for not having Shepherd's Purse up here. The spring-loaded, seed-spray mechanism is fascinating. It's almost impossible to pick the seedpod by hand. I finally cupped the seedpods in my hand and pulled. 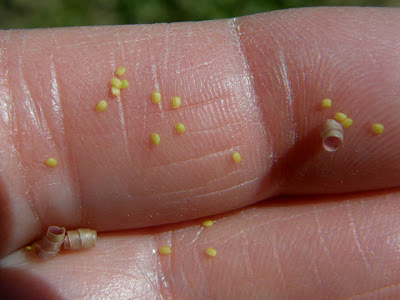 The seeds and rolled-up pod halves were trapped in my hand. I keep forgetting to take a pair of scissors to try snipping the stalk and see if I can collect them that way. Hmmm... Should I Or Shouldn't I?